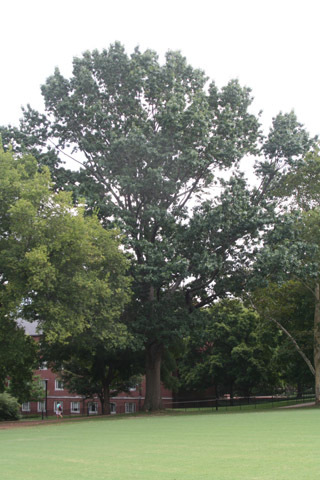 Although this is not the largest red oak in arboretum, it is the largest one on main campus, with a diameter of 106 cm (42 in. ), height of 28 m (92 ft.), and impressive crown spread of 26 m (85 ft.). It is also prominent because of its location at the north end of Alumni Lawn, where it towers over commencement ceremonies each spring. Red oak leaves have the typical pointed lobes of oaks in the red oak group. A feature that is perhaps more distinctive is the "striped" look of the bark caused by flat-topped ridges in the bark. You may notice this when you look up the trunk of this tree. This organism is a living specimen that is part of the  Vanderbilt University Arboretum  with the local identifier 3-419.